Teachers taking risks and trying new strategies from Tina Pelletier and Data Digs. 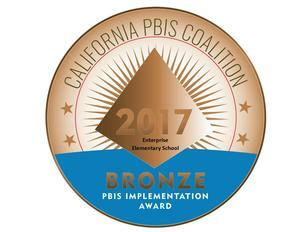 On behalf of the California PBIS Coalition, we are pleased to recognize ENTERPRISE ELEMENTARY SCHOOL for successful PBIS implementation at the Bronze level. Your school is a recipient within the California PBIS Coalition’s System of Recognition, reflecting excellence in the measurement of fidelity as well as your efforts in implementing the core features of Positive Behavioral Interventions and Supports. LANCASTER – New doors are opening for students at Enterprise Elementary School. A student lounge is now available to help boost positive behavior during playground time, school officials announced recently.